Did you catch that title up there? I’m just going to keep repeating it: Domo! 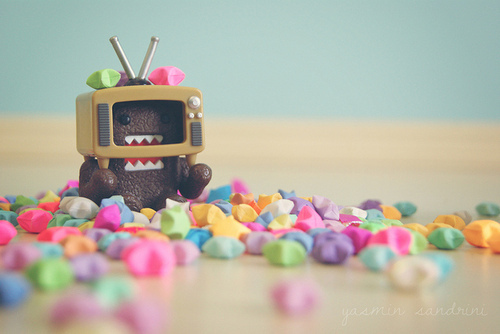 Domo with candy and a TV on his head!! I haven’t read any ‘Domo’ books yet but I want to, oh how I want to! I think Julia would adore these – she loves her Domo plushy that she won here, oh so much! This is the rundown of the plot I saw on Amazon – doesn’t it sound AWESOME??? If you think life will be a sad and lonely place unless you have your own Domo, you can find them here.